For many years this has always been our number one activity in our beaches in Tenerife. 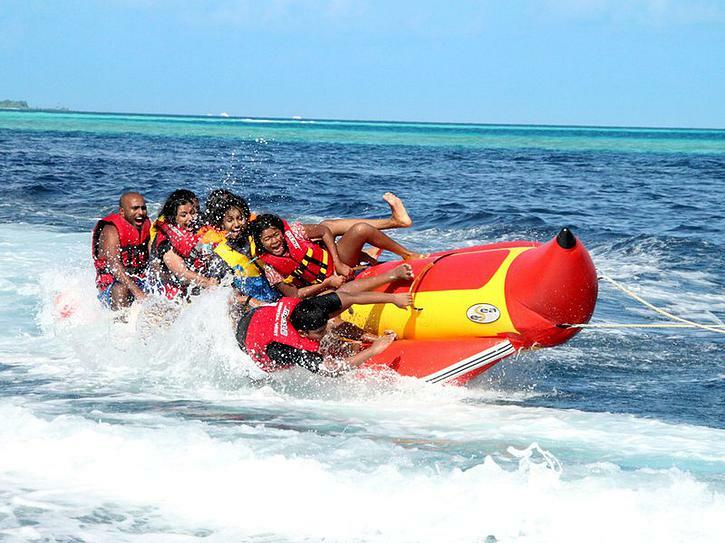 With the Banana Boat in a group of other participants (maximum 8 people) you will enjoy great and funny moments in a short 10-15 minuntes long crazy ride. Anyone older than 6 years can ride it and can be rented for a group, for a person or just for you and your couple.Try it and you wont regret! BANANA Boat Fun Rides starts from Las Americas every day at 12:30 AM, 01:30 PM, 02:30 PM and 03:30 PM. In order to make your booking of BANANA Water Fun by the Beach easy and comfortable Tenerife Host use the most advanced and user friendly booking platform TripsPoint.com where you can easily check last actual prices, the tour availability, required booking deposit and book this tour. To get more information of BANANA Water Fun by the Beach and do booking, please, click the button ‘Book Now’. You will be taken to the tour page at TripsPoint.com where you can easily book the tour. Once the booking of BANANA Water Fun by the Beach made at TripsPoint you will get your tour Voucher / booking confirmation with all details, including exact pick-up point with pick-up time and map. No Pick Up service included. You will have to reach the beach by yourself. Our representative delivering your tickets will explain you in details how to do it easily. You can call us or use WhatsApp for free text messaging.Be safe and feel comfortable with our support during your stay in Tenerife.